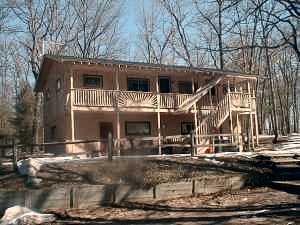 The lodge is unique among lodging facilities in the Wellston area. The building consists of 3 units that can be rented seprately or together. Rivers is truly world class or you can fisj Pine Creek or some of the many lakes in the area. Tippy Dam backwaters still holds the State record for Walleye. You can walk to Enchanted Acres Livery for a canoe or kayak trip on the Big or Little Manistee Rivers. You can go on two tracking adventures. Bring your camera and catch wildlife in the forest. This area is a great place to get away to. If outdoor adventure isn't for you you might like visiting Manistee with its shops and museums, or the Little River Casino to try your luck. A drive along the Lake Michigan coast line will bring you to awesome vistas and interesting towns and parks. 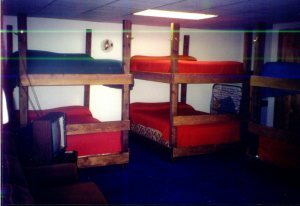 Unit 8 is the bunk house. It contains 6 full sized beds that are bunked into 3 units. It has a full kitchen complete with dishes and some pots and pans. It also has a bathroom and seperate shower room. There is a sitting area with couch and love seat. 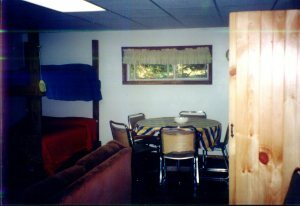 Located on the upper floor of the Lodge Unit 7 has 3 bed rooms a full kitchen and a bathroom with shower. With 2 full beds and 2 single beds the unit can sleep up to 6 people. The unit also has a sitting area and large table. 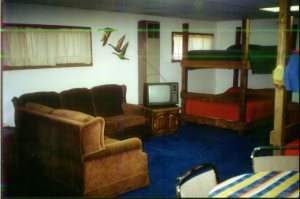 Located on the upper floor of the Lodge, this unit is a small room with 2 full beds and a bathroom with shower. This unit does not have kitchen facilities and is often rented as an additional room for unit 7 or 8 but can be rented seperatly. Located near by the Lodge is a large fire pit and picinic tables are available for your use.